Here's the thing about Puerto Rico: it's kiiiinda awesome. I mean, it's a U.S. territory (meaning no passports for Americans, no changing money, no language barrier), a short flight from the lower 48, AND an affordable place to escape to for a few days. Oh, and did I mention that it has a tropical Caribbean climate year-round? Yeah, Puerto Rico really impressed me. 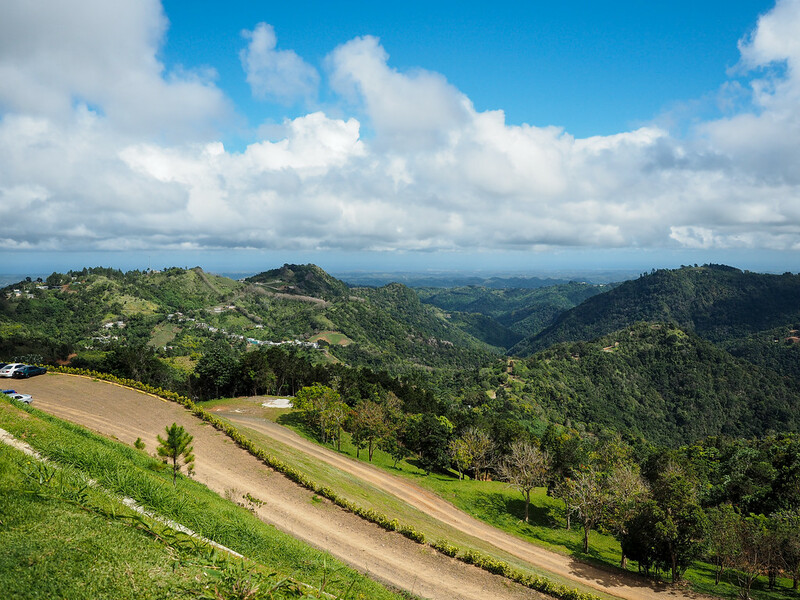 Not only is it easy to travel to, but it's also got just about everything you could want in a destination – pretty beaches, rainforest, cute cities, culture and history, delicious food, and plenty of adventure beyond the big resorts. And I think Puerto Rico might just impress/surprise you, too. 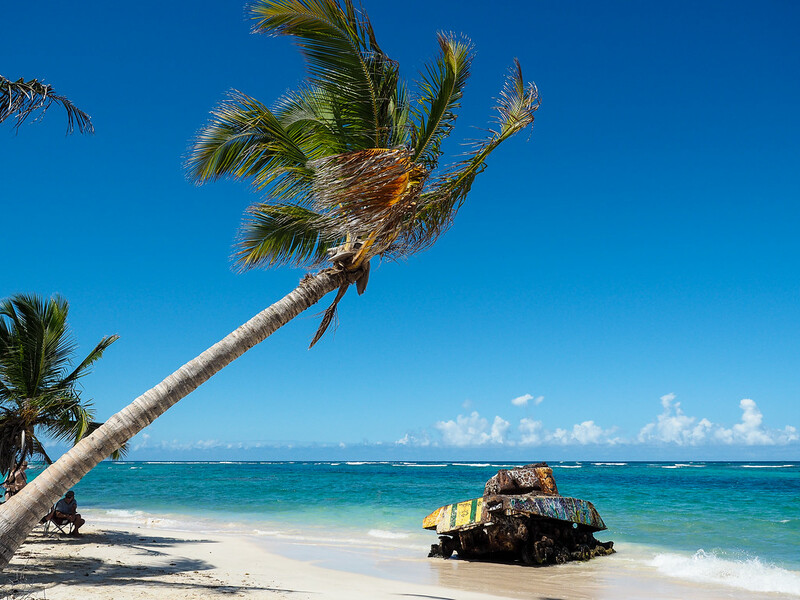 I could go on and on about why Puerto Rico makes a great travel destination. But, for now, I'm going to let these photos do the convincing. 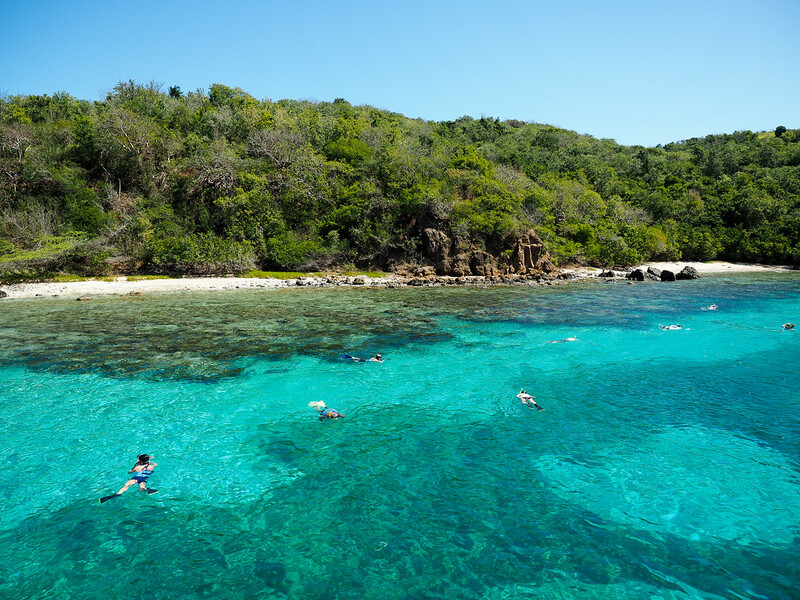 Snorkeling off Culebra Island in water that looks like it's been dyed with Kool-Aid (it definitely hasn't been). 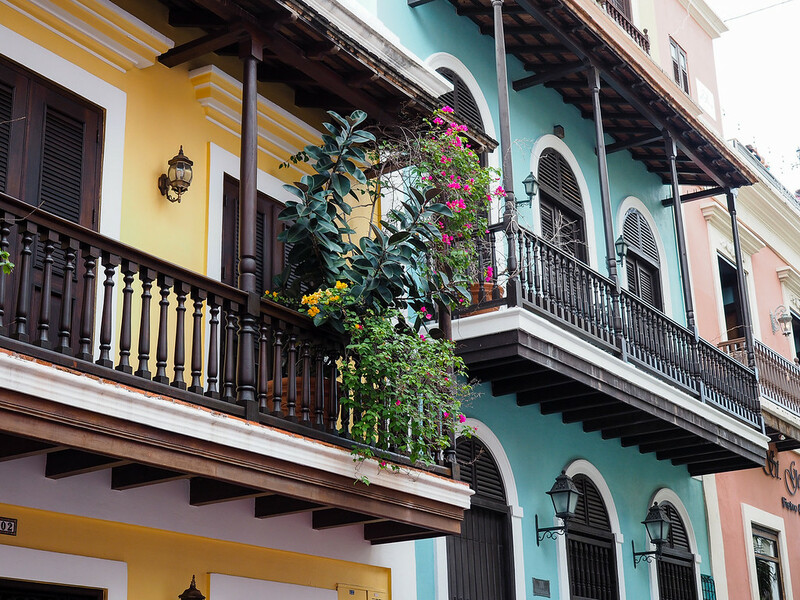 The colorful buildings and wrought iron balconies of Old San Juan. Me riding “The Beast,” a mile-long zip line at Toro Verde Adventure Park. What a rush! 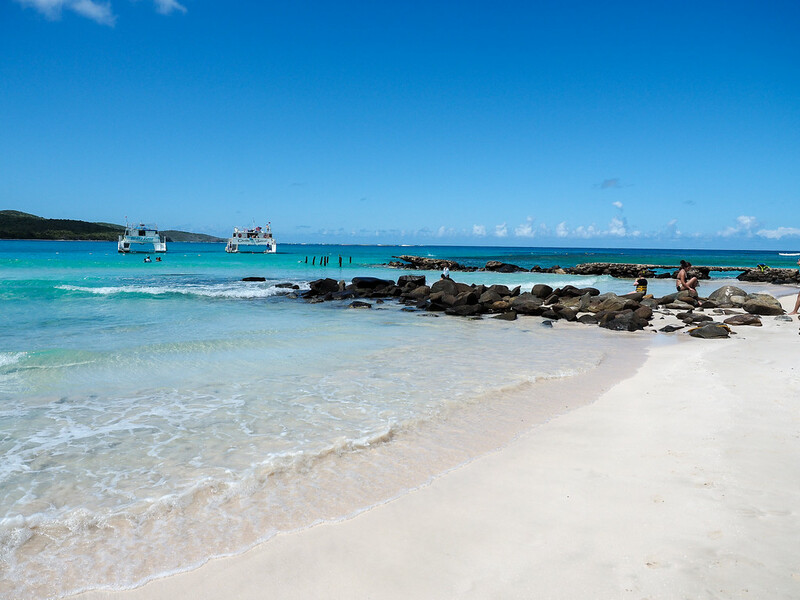 Coming ashore on Flamenco Beach on Culebra Island. 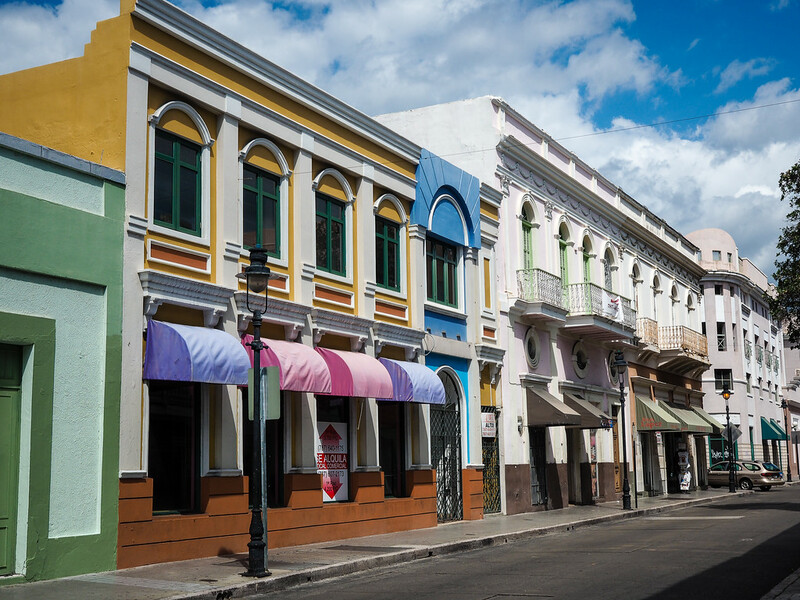 A colorful street in the city of Ponce, on Puerto Rico's southern coast. Looking down towards the pool area of the Caribe Hilton in San Juan. A gun turret at the Castillo de San Cristóbal, an old Spanish fort in San Juan. During and after WWII, the U.S. military used Flamenco Beach for a variety of training exercises. This tank was one of a few things left behind. 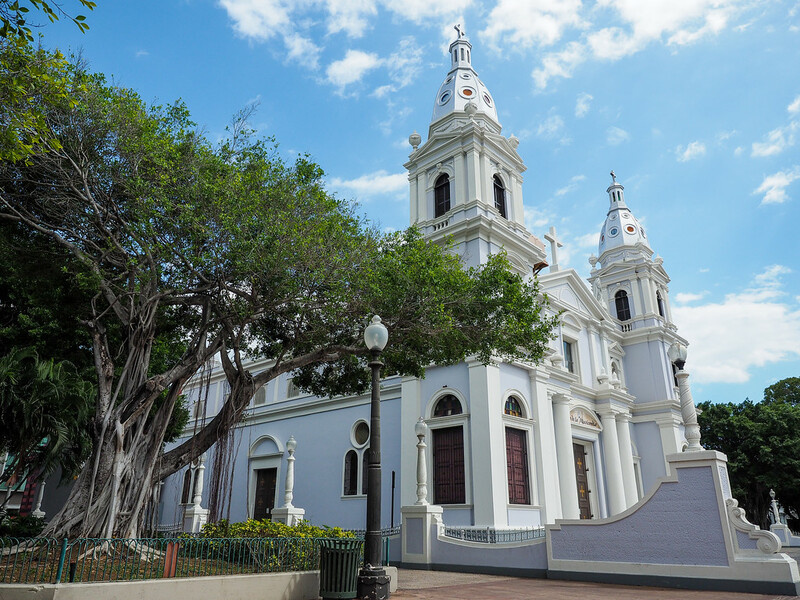 The beautiful cathedral in downtown Ponce, Puerto Rico. 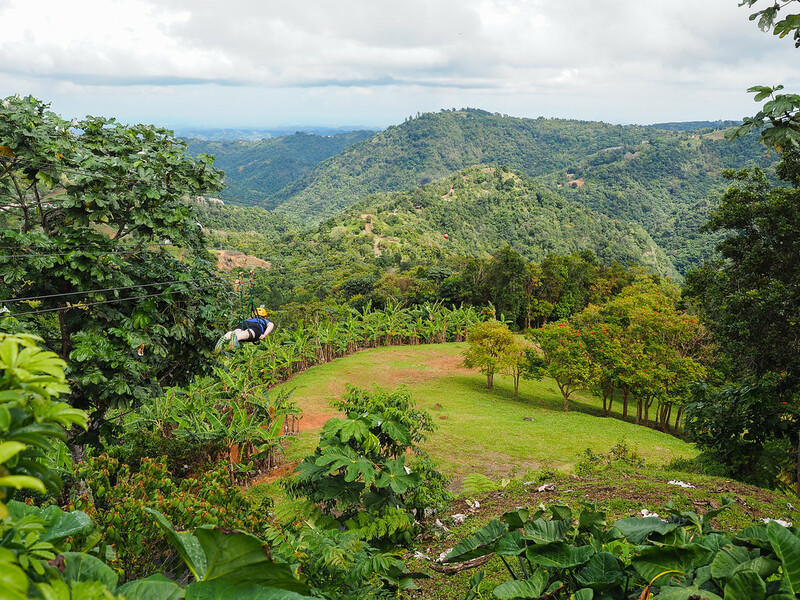 Looking out over Toro Verde Adventure Park, up in the mountains in central Puerto Rico. 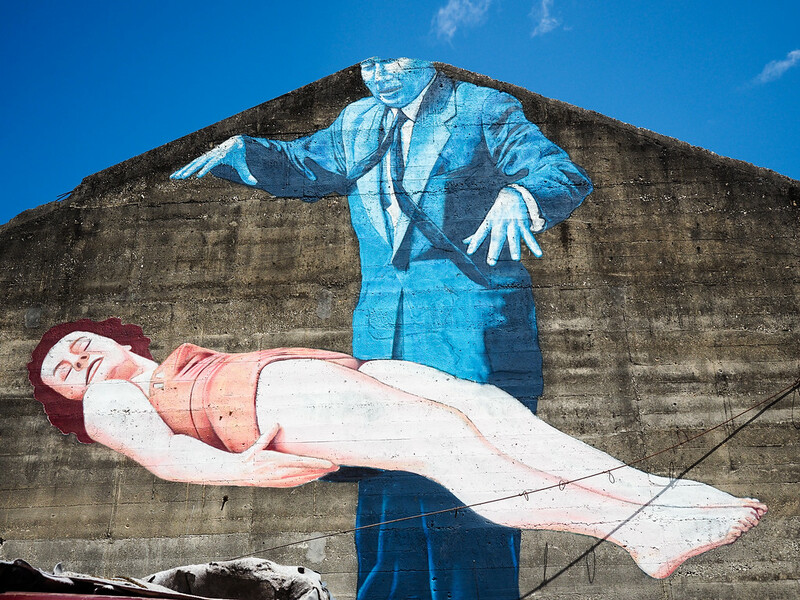 Sweet street art in the Santurce neighborhood of San Juan. Doorporn in Old San Juan. 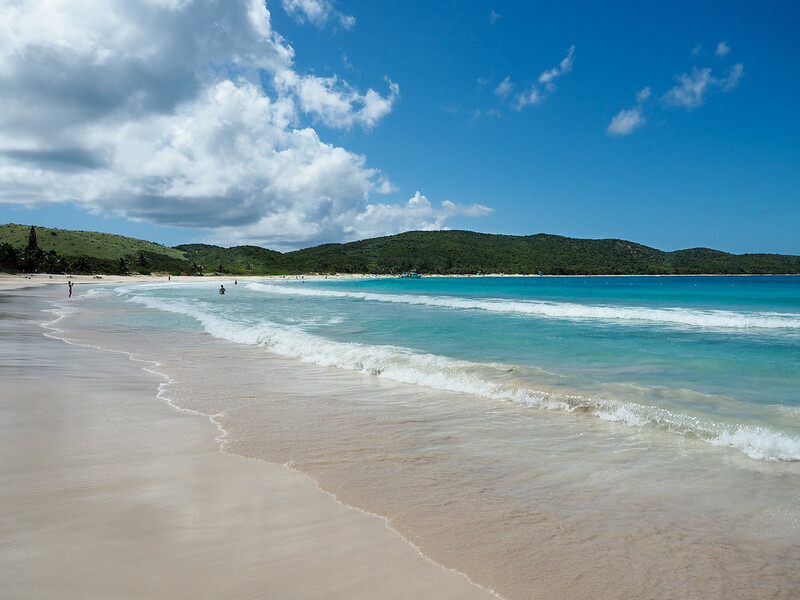 Flamenco Beach on Culebra Island. 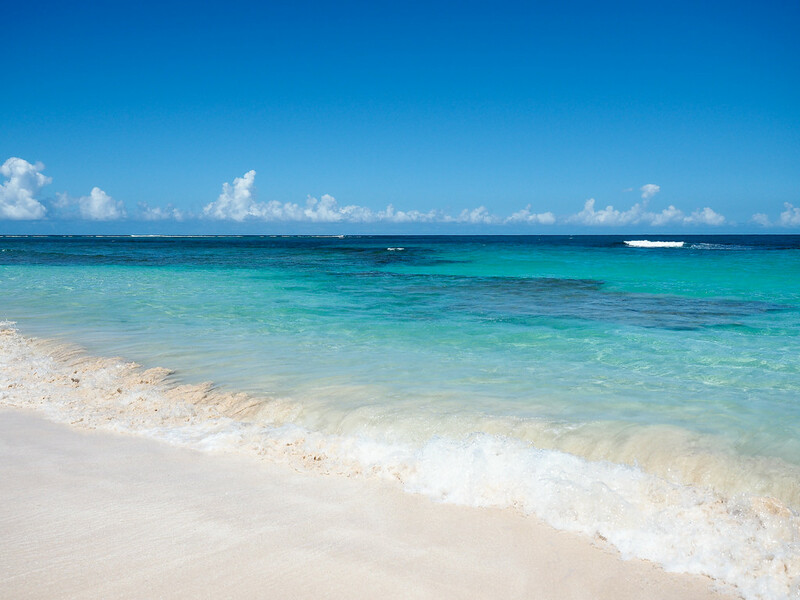 This beach is consistently voted one of the most beautiful in the world! 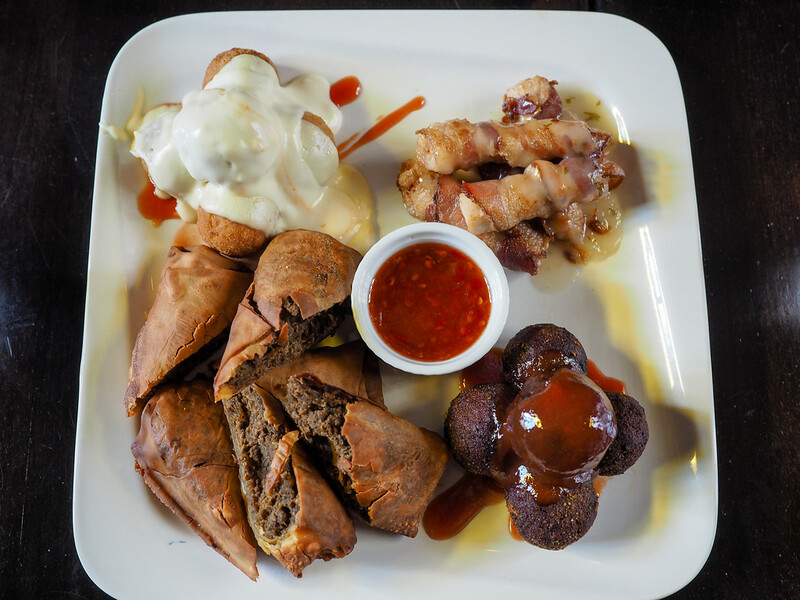 Modern Puerto Rican food – yum! 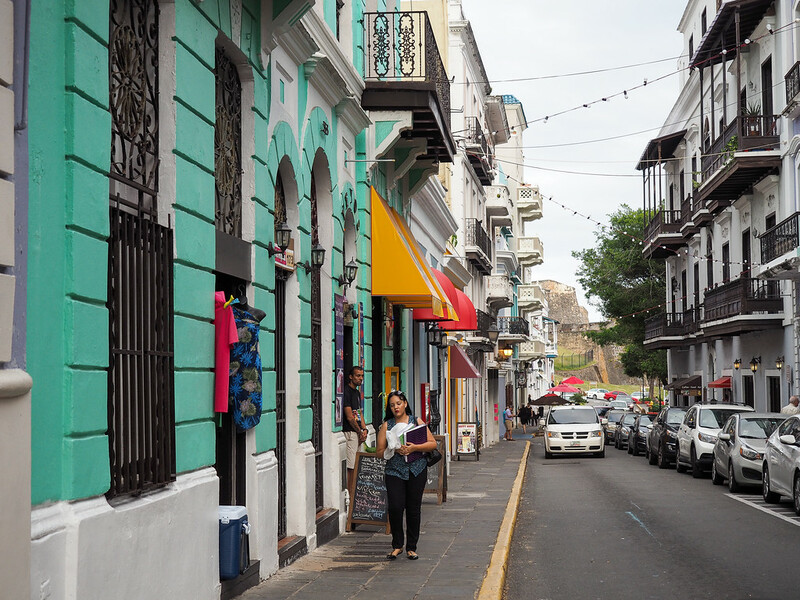 A street scene in Old San Juan. Balconies in Old San Juan. No, the color of this water off Culebra Island isn't edited at all!! 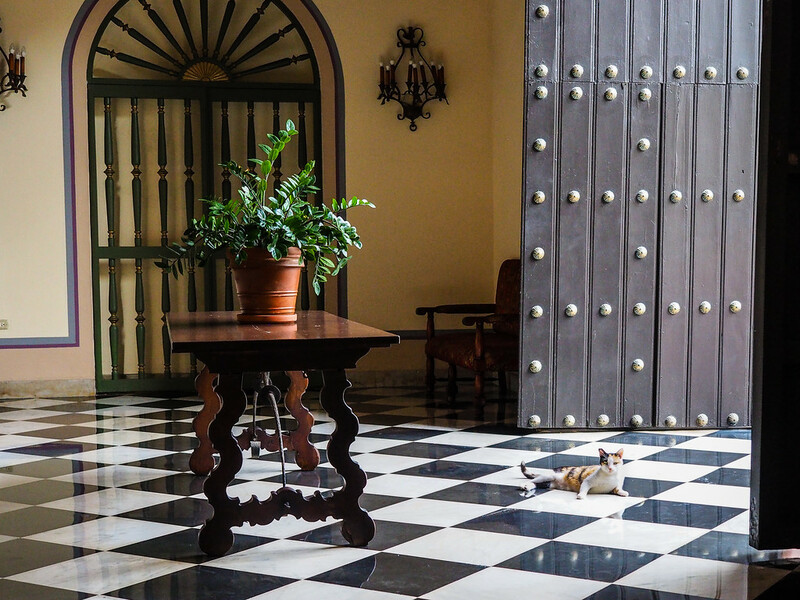 A cute kitty chilling in the entrance way to a hotel in Old San Juan. 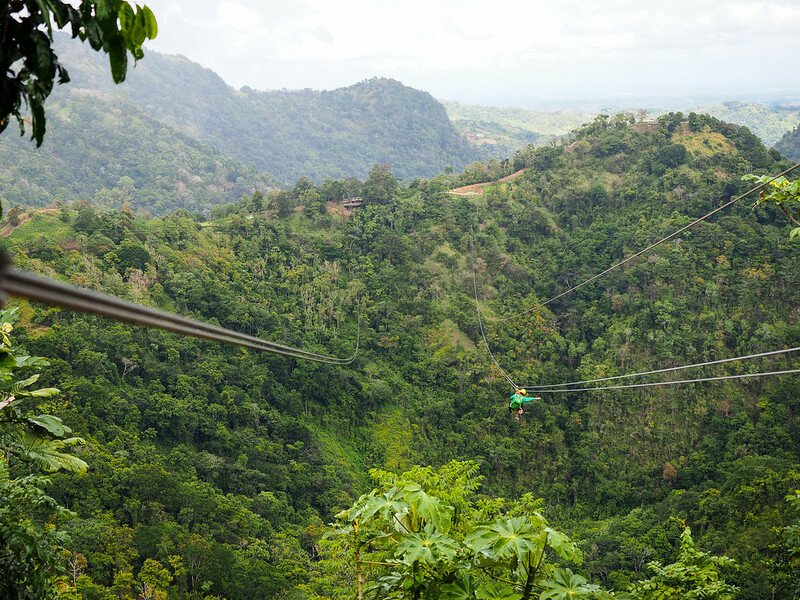 Zip lining at Toro Verde Adventure Park. 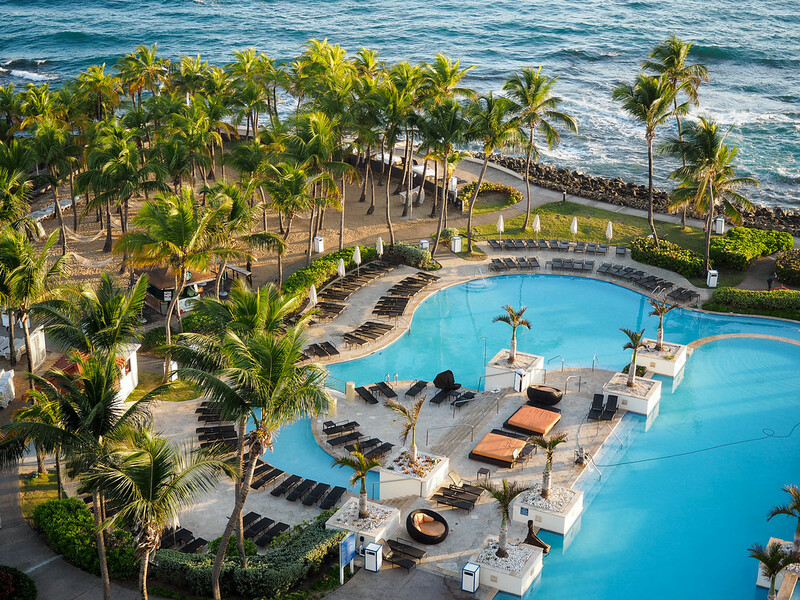 The pool area at the El Conquistador, the largest resort in Puerto Rico. Another street scene from Old San Juan. I could have walked these streets for hours! 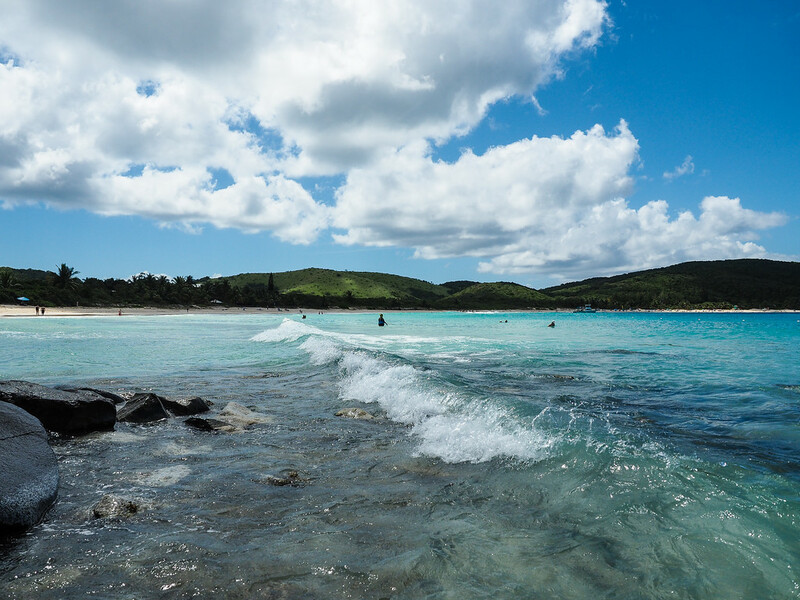 A windy day at Flamenco Beach. 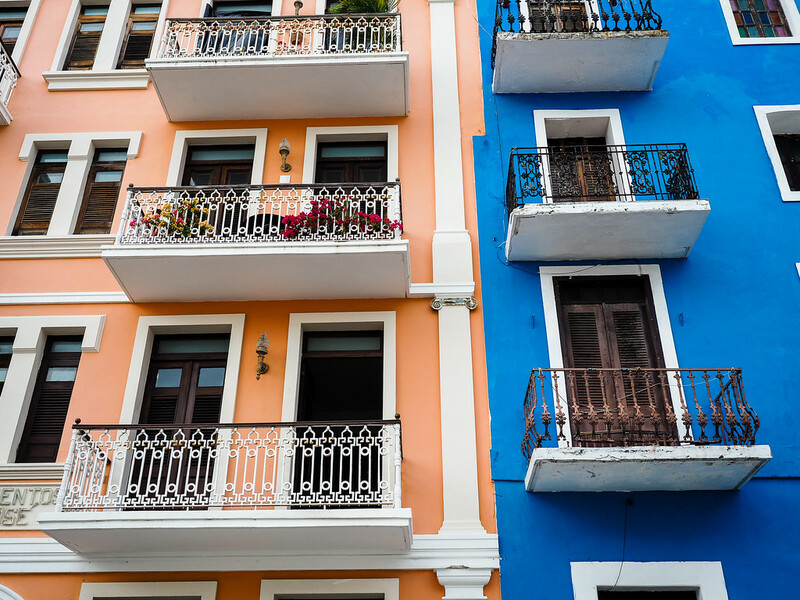 Colors of Old San Juan. The city dates all the way back to the 1500s! 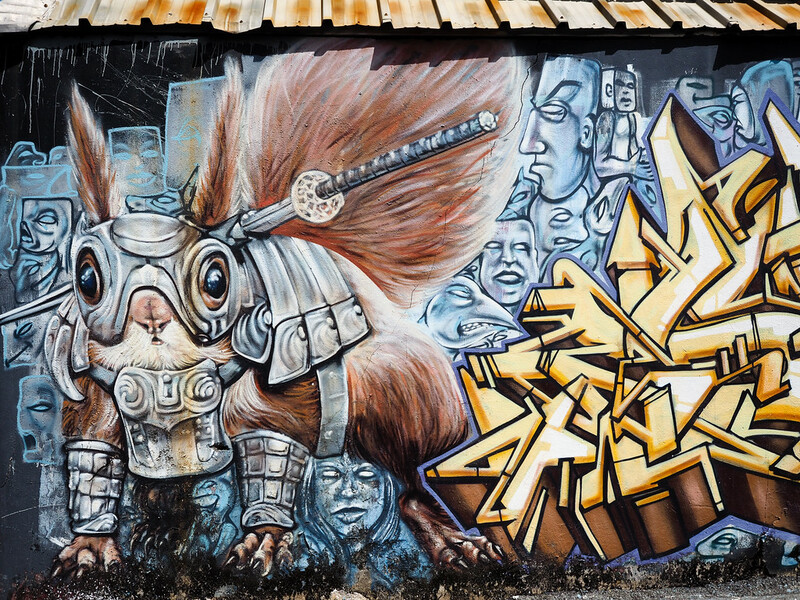 More street art in the Santurce neighborhood. 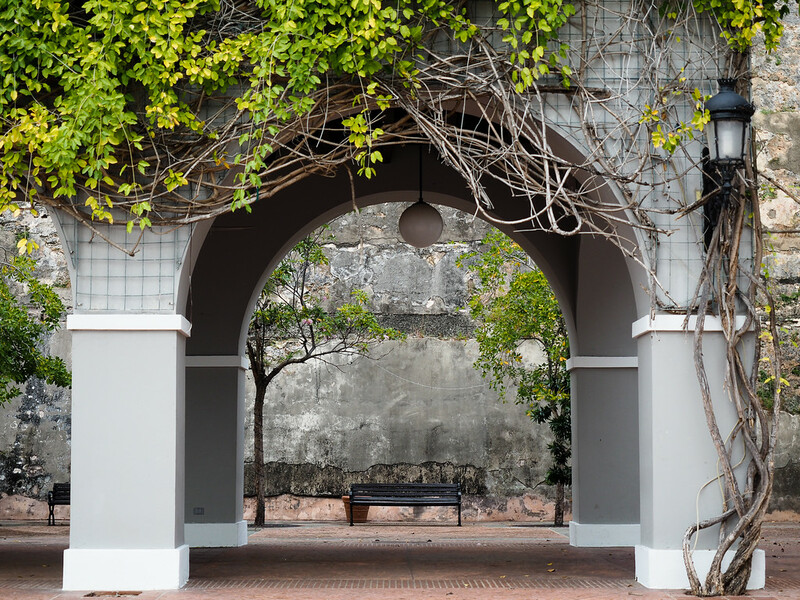 A nice place to sit in Old San Juan. So what do you think? 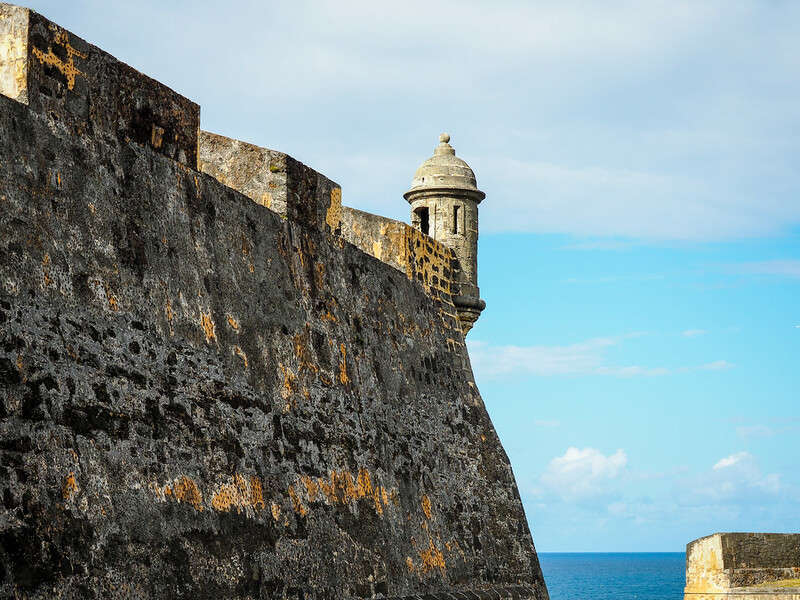 Are you going to add Puerto Rico to your must-visit list? Which photo is your favorite? *Note: Thanks to the Puerto Rico Tourism Company for hosting me on this trip. As always, all opinions (and photos) are 100% my own. 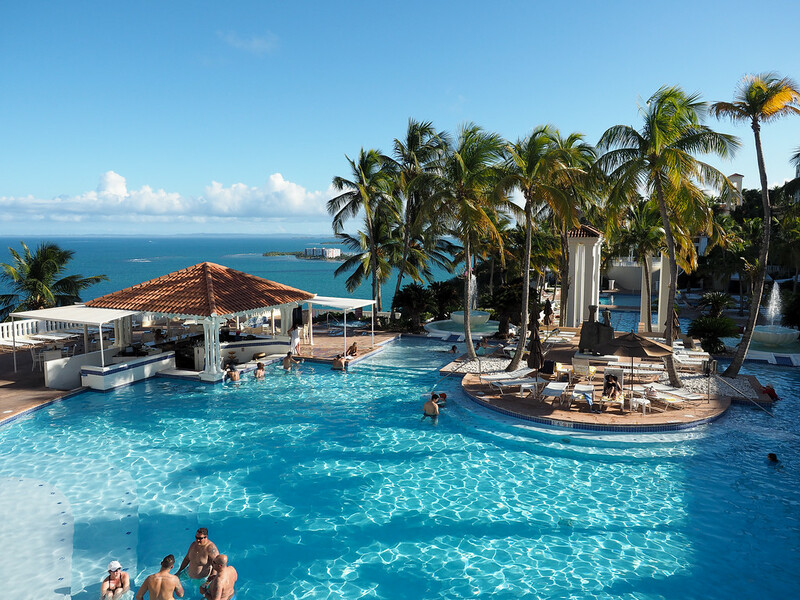 Well, the El Conquistador IS the biggest resort in Puerto Rico! I didn’t stay there this time, but I totally want to go back – both to stay there, and to explore more! 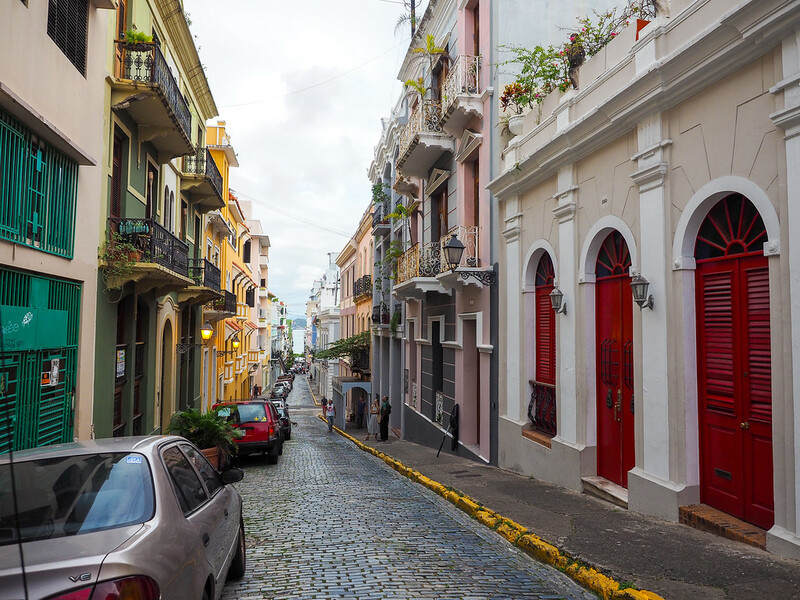 Old San Juan was much bigger than I expected – a few hours of wandering simply wasn’t enough! Thank you so much for show the world how beautiful is my island. Puerto Rico is a little piece of a paradise. I’m from the center of the island, the mountain of Puerto Rico, but live in Ohio and I try to go there every three year. I remember every place that you took those picture. Thank you again and continue enjoy my island. Wow! Great photos. I can’t wait to read more about it later in the month. I’m particularly interested in how you got along language-wise, so I’m hoping you touch on that! I had absolutely no issues language-wise! Spanish is the predominant language spoken, but just about everyone speaks great English, too! Love your photos! I went to Puerto Rico a few years ago and LOVED it. We met tons of great people there, the food was amazing, and the views are beautiful. I concur with everything you said! Great people, food, and landscapes! Pretty much everything I could ask for. A friend of mine in Riga just got back from a week in Puerto Rico and absolutely raved about it. With winter here continuing to drag on strong, I am definitely tempted to book a trip of my own! Do it!! It’s a great (and easy) place to travel! Me neither! And Puerto Rico certainly had plenty of all those great colors! Wow, agreed! These photos are great! I literally can’t pick a favorite – ocean, resort, city? They’re all stunning. Hope to make it to Puerto Rico soon! Thanks, Liz! I had fun putting this one together. Puerto Rico sure is photogenic! My parents and I went to San Juan on a Caribbean cruise years ago. Our ship docked in the evening, and we didn’t get to see much. Ah, that’s a bummer! I guess you’ll have to go back sometime! Great photos Amanda! I almost made it to Puerto Rico last year but it didn’t pan out. Now I’m really regretting not getting there. I’ll definitely have to add it to my list again. Also I noticed that your post was full width (sans sidebar). Are you going full width for all of your new posts? Yes, definitely make sure to put it back on your list! It’s pretty awesome. And no, I won’t be going full-width on all my posts; just photo essays! Love the door pic! I’m a sucker for those 😉 Puerto Rico sounds like an awesome place, and one that I never really considered because like you said, it’s part of the US. But I have several friends from Puerto Rico who talk it up well, so maybe a trip there is on the docket for sometime soon. Other than a few chain restaurants in San Juan, it definitely doesn’t *feel* like the US. You should definitely consider it! Great to hear! I know I’ll certainly go back. There are so many beautifully colored houses! I also definitely wouldn’t mind if I could hang out by that pool right now – winter in Europe has been too long! 😉 Beautiful pictures, Amanda! So beautiful!!! I love them all. The blue water is amazing!!! And it’s not even Photoshopped! The water is legit that color!! Wow the colors are stunning..that alone makes me want to go! Do it! It’s colorful and warm, and not too difficult to get to from North America! You actually do not have to convince me as I am already planning to go there this year but your post and your photos absolutely increased my wanderlust. Great to hear, Stef! I feel like Puerto Rico is becoming a bit of an “it” destination lately – which I totally support! Beautiful pictures! We’re actually going to be there for our 2nd honeymoon this december so I’m really looking forward to it! Hey Amanda, stellar photos. Wow, the blues! Pow! And that street art is incredible. 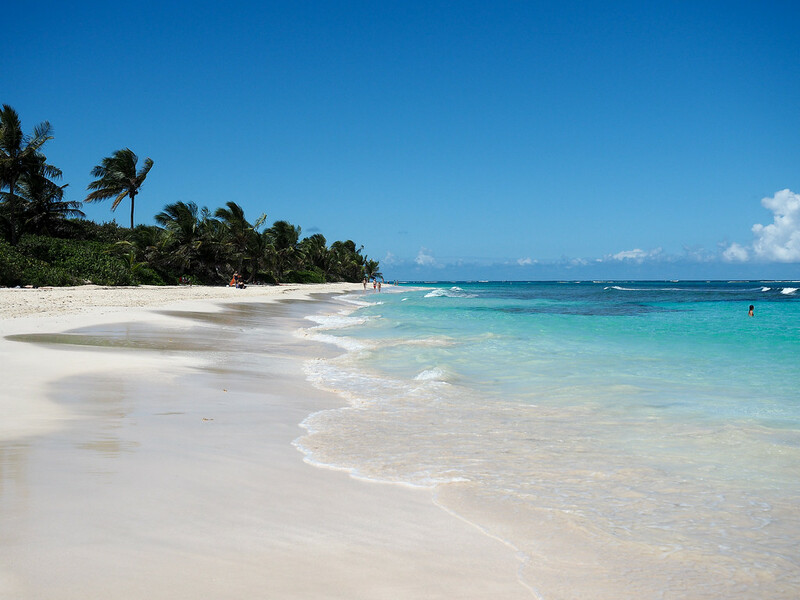 I’ll someday make my way down south, but Puerto Rico will definitely be on the list now. By the way, off topic, how do you post such large and clear photos and have them load so fast? It was like zip-bang color explosion instantly! 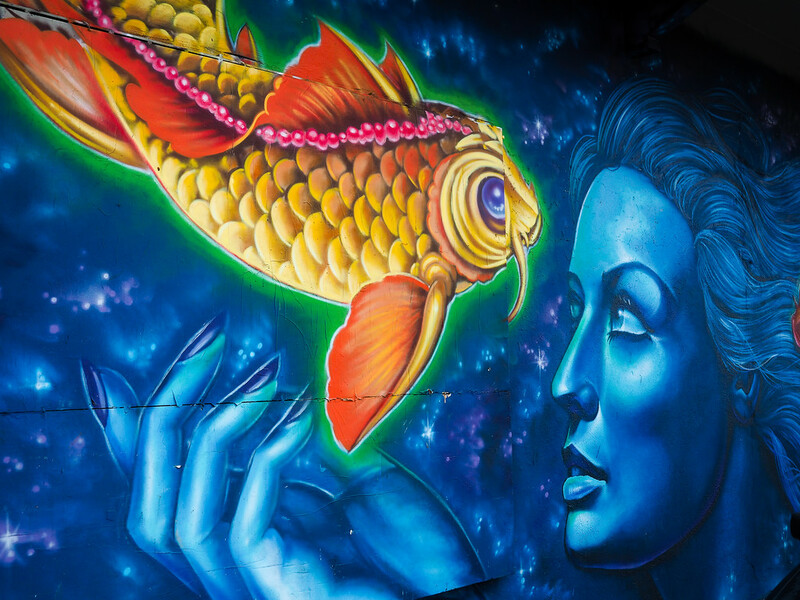 I went on a little impromptu street art tour my last day in San Juan, and was SO glad I did – there’s some incredible stuff to be found! Your photos are super gorgeous, Amanda! A friend of mine is going to Puerto Rico soon so I’ll send her a link to this post. It looks epic! Thanks, Miriam! 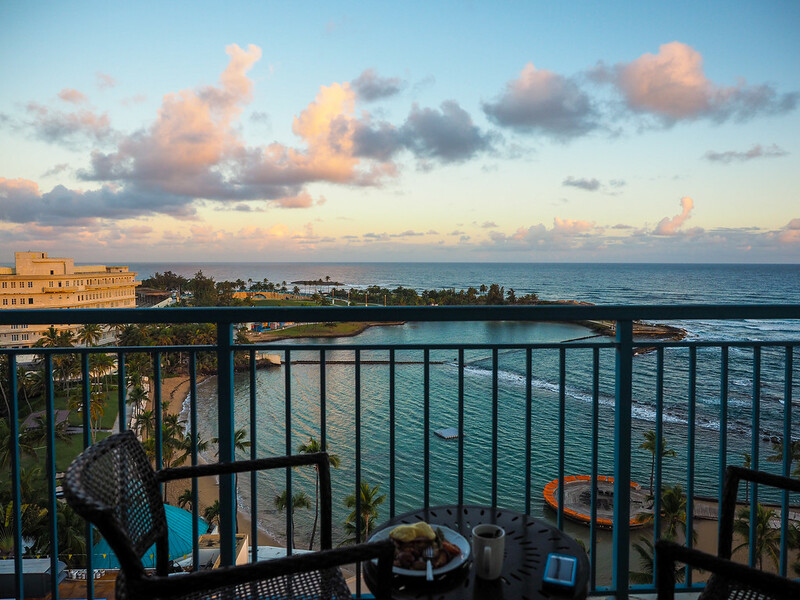 I loved this trip – I hope your friend enjoys Puerto Rico, too! Wow Puerto Rico looks amazing! It’s never really crossed my never ending bucket list before but it might just now. Beautiful pictures! Makes me want to jump on a plane right now! Seeing these photos reminds me that I am long overdue for a tropical getaway! I’ve had a few long layovers in Puerto Rico (en route to Virgin Islands) and had a chance to walk around Old San Juan. Definitely a convenient place to vacation due to the factors you mentioned! It makes for a great Caribbean getaway for sure! I’m leaving for Puerto Rico tomorrow, and I’m *so* excited! These pictures have pumped me up even more. 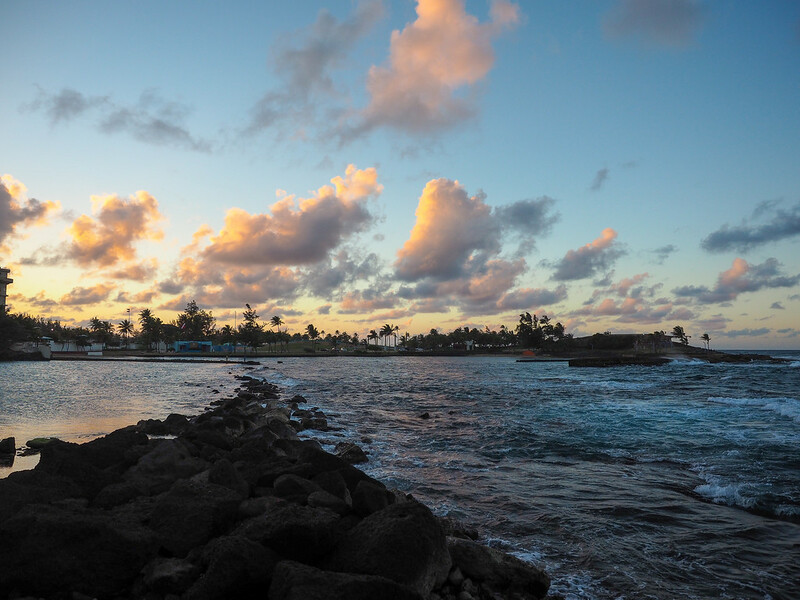 What was your favorite thing you did in San Juan? Awesome! I hope you loved it! 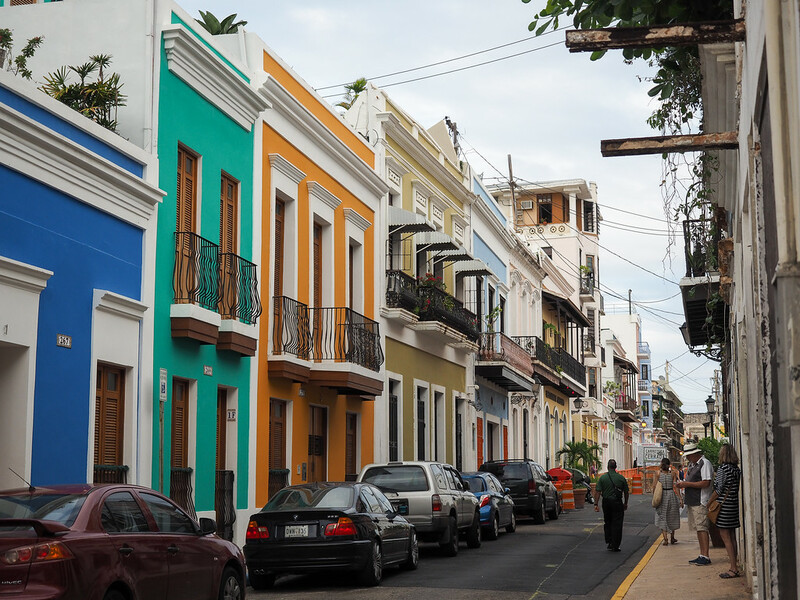 My favorite thing in San Juan was probably wandering around the colorful Old Town! I found out I liked the Caribbean when I visited Bonaire and Curacao a month ago. 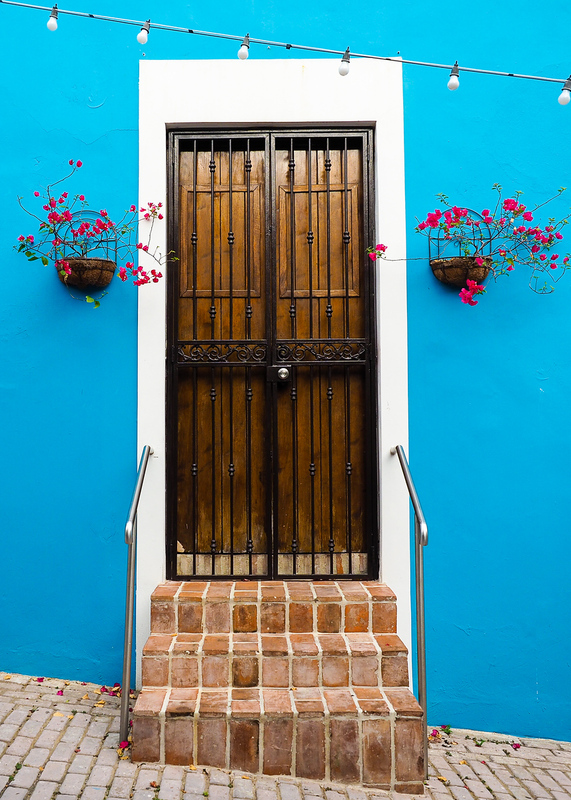 The pictures of Puerto Rico look insanely gorgeous too! I can’t wait for the posts about what there is to do and see in Puerto Rico. I will definitely be writing more about it soon! There´s actually a ton to do, for it being a relatively small island. ‘Love it! ‘Love it! I’ve never been to Puerto Rico and I love the photographs of features of the island. This was my first trip there, too, and I was very pleasantly surprised – I LOVED it! It does! And even though it´s actually part of the US, it often does feel like a completely different country! These photos are gorgeous! A close friend of mine chose to have his heading in PR later this summer and I was a bit perplexed as to why. Well, I’ve never been and didn’t anticipate the feel of this destination. Not I’m that much more excited to experience it in person! That´s great to hear, Alex! I think PR should make a great wedding destination! I love how you captured the beauty of Puerto Rico! It makes me feel proud to see how beautifully visitors see our island and how much they enjoy the island life! I definitely did enjoy it, Cristina – I’m already dreaming about a second trip! There are a couple photos in here from the center (like the ones from Toro Verde). Unfortunately these are all I have from this trip! Yes, all these photos were taken by me! I was born and live in Puerto Rico all my life, I am also a travel agent who’s traveled to many countries and still amazed with your pictures. We get so used to see this views frequently you forget to appreciate the colors. Thanks for such amazing review of our island and people. We love to welcome everyone.! I definitely know what it’s like to take for granted things that are right in your backyard. Glad you enjoyed the photos! OMG that snorkeling spot, sign me up!